Demonstrators fed up and out raged by the fatal police shooting of a Black man during a suburban traffic stop kept vigil outside the governor’s mansion in St. Paul Friday while various official spokespersons called for calm and peace as more details emerged about the officer who fired the shots. The Officer Jeronimo Yanez, who shot and killed Philando Castile,Wednesday night has been placed on administrative leave. It appears that it is the intent of the police department to help paint a picture of the officer’s good side so information about his personal life has been released. For example it has been that that Yanez has been a member of the St. Anthony police for four years. He had earned a bachelor’s degree in law enforcement in 2010 and was honored by his college as a top student. In the years since graduating, he had posted online about his wedding and the birth of a child and settling into a suburban neighborhood. Even a professor has chimed in to say that he questioned things, “He always wanted to dig deeper — what if this happened, or that happened,” said Christian Dobratz, one of Officer Yanez’s professors at Minnesota State University, Mankato. “I knew he was very big on wanting to work with others and serving a community,” he added. The problem is that the public relations about Officer Yanez’s background painted a more humane person than what his actions that left Mr. Castile dead demonstrated, yet it is more than the specifics about the shooting that have not been released formally. On the other hand the Minnesota Bureau of Criminal Apprehension, which is investigating,the crime has said little about what led to the shooting , specifically why Officer Yanez and a colleague pulled Mr. Castile over on a stretch of suburban road near the state fairgrounds. What is known about the shooting has emerged from a Facebook Live video by Diamond Reynolds, Mr. Castile’s girlfriend delivering a very clear and concise recap of the ordeal she experienced with her daughter in the back seat who also witnessed what appears (from video footage captured during the exchange with police) to be a gruesome heartless senseless killing. 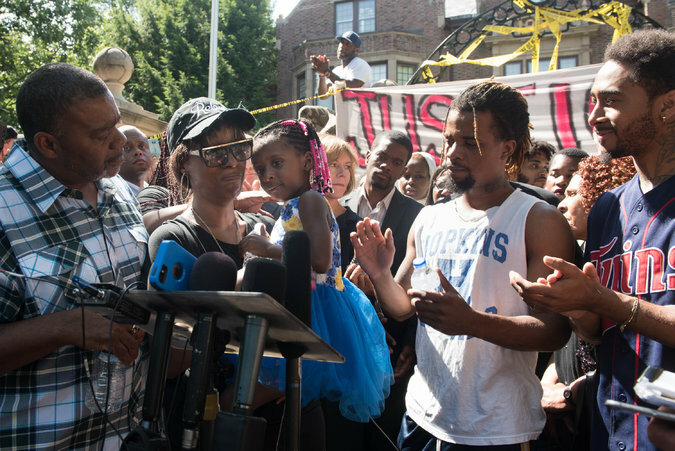 While that footage of Diamond went viral online, protests continued almost nonstop in St. Paul ( the country) and the surrounding area, with activists calling for charges against Officer Yanez and a separate, federal investigation. On Friday afternoon, away from the Governor, in Falcon Heights, the suburb where Mr. Castile was murdered, a group of university students and employees marched to the shooting scene to pay tribute. At the governor’s in a residential area of St. Paul, demonstrators continued to mingle outside the gates in protest. The anger and upset about the continued abuse and police brutality towards Blacks has prompted large spirited and for the most part peaceful protests. One person however was arrested and a police car was damaged early Friday near Gov. Mark Dayton’s home when demonstrations became tense. Prosecutor John J. Choi, in Ramsey County, said he had urged the state agency investigating to be prompt and thorough, but did not offer a timeline on when a charging decision might be made. So far, Justice Department officials have said they were monitoring the state investigation, but have not announced their own inquiry. Choi’s, office will determine whether or not to bring charges, said he was unsure if he would present the evidence to a grand jury or make the charging decision himself. In past cases of this nature Mr. Choi historically has used grand juries in police shooting cases and said he saw benefits in doing so, but that he would consider whether that was the right approach for Mr. Castile’s case. The Democratic Governor Dayton, angered members of law enforcement Thursday by saying he thought Mr. Castile probably would not have been shot if he were white,. On Friday he said that he was standing by those comments.